Help young children develop a close and enjoyable relationship with books, a vital step towards literacy. 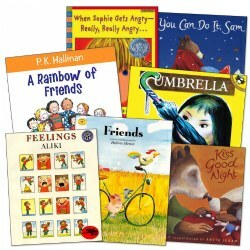 Kaplan offers a wide selection of children's books including factual books, fantasy books, and books about people of different races, cultures, ages, and abilities. Find board books, big books, cloth and vinyl books, and chapter books to build your classroom library as well as book and puppet sets to entertain and bring stories to life. 3 months & up. 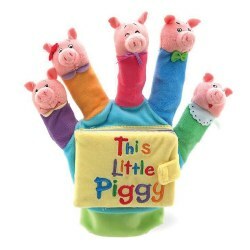 Soft and textured finger puppets and simple rhyming stories will bring giggles to babies and toddlers alike. 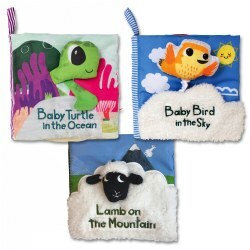 Babies can focus on the bright colors, tactile exploration, and pointing out images. Toddlers will start looking at pictures and text and build listening and language skills. Set of 2. Grades 1 - 4. Join Jack and Annie on adventures through time and space. Filled with Factual information, these books are great for connecting fiction with non-fiction texts. Paperback. 6 months & up. 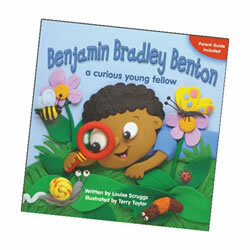 Discover the bright animals, sea creatures, birds, and bumble bees. Every page has colorful images, variety of unique textures, friendly characters and even crinkle paper. 6 pages. 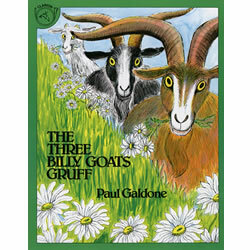 Book measures 6.5"L x 2.5"W x 6.5"D.
The three goat brothers brave the terrible troll in a colorful version of the classic tale. Paperback. 32 pages. 4 - 8 years. 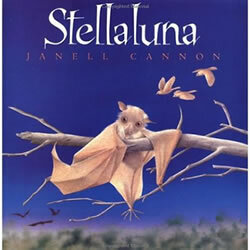 Baby bat Stellaluna's life is flitting along right on schedule--until an owl attacks her mother one night, knocking the bewildered batlet out of her mother's loving grasp. The tiny bat is lucky enough to land in a nest of baby birds, but her whole world has just turned upside down. 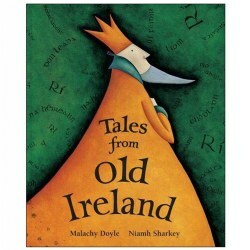 This gorgeously illustrated book is sure to be an all-time favorite with readers, whether they've left the nest or not. Hardback. 28 pages. 3 - 6 years. Leap into learning through reading and build a fantastic library collection! We have blended traditional and newer titles for a variety of themes, illustrative techniques, and writing styles. Paperback-hardback combination. Set of 13 books. 10 years & up. The champion of the destitute and downtrodden rides again. 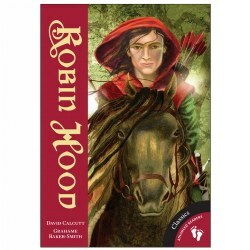 Meet young Robin Hood before he becomes the hero of Sherwood Forest, and follow along with his band of merry men as his adventures become the stuff of legend. This lavishly illustrated picture book features nine tales including: "Robin Becomes an Outlaw," "Robin Meets Little John," "Robin and the Widow," and "Robin's Last Battle." Paperback chapter book. 176 pages. 10 years & up. 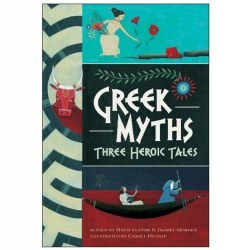 Immerse young readers in three classic adventure tales from ancient Greece with this dynamic new chapter book. 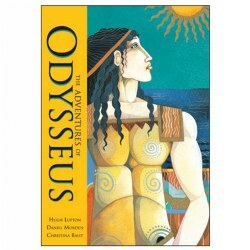 Includes the popular myths of Demeter and Persephone, Daedalus and the Minotaur, and Orpheus and Eurydice to give kids a head start in English class. Bursts with illustrated character lists, a glossary, a Greek gods family tree, and a map of ancient Greece to make mythology kid-friendly. Paperback chapter book. 136 pages. 10 years & up. 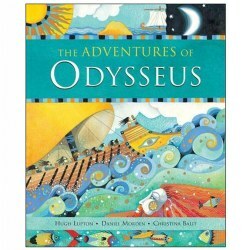 While sailing home from war, clever Odysseus makes a terrible mistake. He'll need both ingenuity and humility to outwit the gods and monsters that stand between him and his family. Will he ever make it home again? This daring adventure has been told and retold for thousands of years - and now, in a gorgeous large format paperback gift edition with watercolor, gouache and gold ink illustrations, it's better than ever. Paperback. 96 pages. 8 years & up. As Odysseus fights to find his way back home after the long and brutal Trojan War, he has to endure harrowing ordeals and adventures, and come to terms with devastating losses. Storytellers Hugh Lupton and Daniel Morden's graphic retelling breathes new life into this great classic. Paperback chapter book. 128 pages. 3 years & up. Children, therapists, and teachers will benefit from this collection of titles full of encouragement and support. Lessons abound from support in the face of common childhood fears to the will of a hearing impaired child to dance. A must for every classroom! 18 months & up. 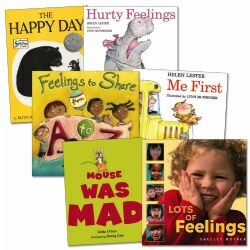 Each book helps young children learn about their emotions. Identifying feeling is the first step in emotional intelligence. Showing example of what emotions look and feel like help children better understand how to deal with them in various situations. 3 - 7 years. 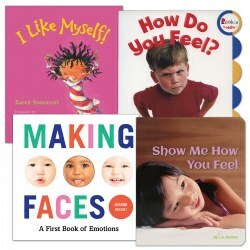 Each book helps young children learn about their different feelings and why they have them. Understanding their own emotions is the first step by showing examples of what it feels like, looks like, and how to deal with your feelings in all situations. Set of 6. 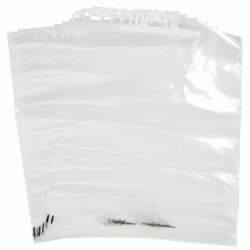 Carry bags with handy snap-lock handles. Set of 10. 20"W x 25"D. Book Rack sold separately (item # 60537). Books are not included. PreK - K. This entertaining story about a curious young fellow will delight young children while the enclosed parent guide will support transition into kindergarten by helping parents learn how to use Common Core based strategies every time they read aloud to their preschooler. Paperback. 6 months & up. 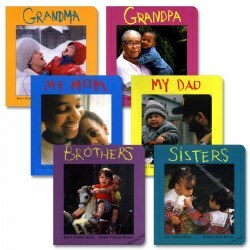 This set of six board books use candid images common to a child's world to teach concepts of family structure and diversity. Includes Grandma, Grandpa, My Dad, My Mom, Sisters, and Brothers. Our indestructible books are perfect for your infant classroom because they are soft and paper-like, yet waterproof, tear-resistant, and dishwasher and washing machine washable! . The vivid artwork doesn't need words to keep the child's interest. Each book is designed to encourage conversation about the pictures. These titles by Kaaren Pixton will delight children everywhere. Titles include 'Creep! Crawl! ', 'Flutter! Fly!' and 'Wiggle! March!' Set of 3. 2 years & up. 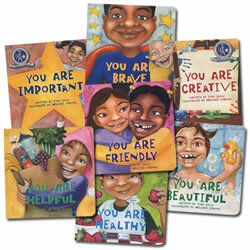 This unique series, with vivid images of children's everyday lives, supports affirming messages that build healthy confidence and let children know that they are valued. 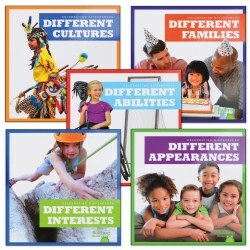 The artwork depicts children and adults of all ages, abilities, and ethnic backgrounds, making this set a perfect addition to any classroom library. 3 years & up. 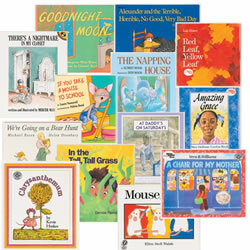 Each of these stories include colorful illustrations, rhyme, and repetition, making it easy to enjoy and follow along. Books include: Duck on a Bike, Giraffes Can't Dance, Alice the Fairy, and Is Your Mama a Llama? 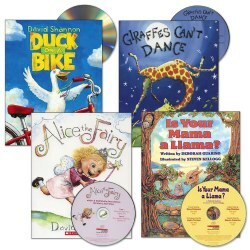 Each book features a corresponding CD to listen and follow along while reading. 1 year & up. 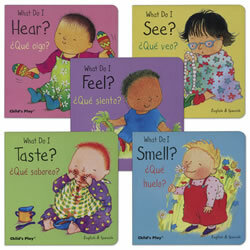 Explore the five senses with this bilingual board book set. 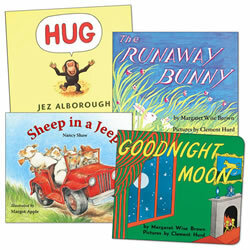 Each book features simple words with easy to understand illustrations. 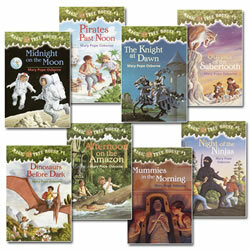 Set of 5 board books. 3 months & up. 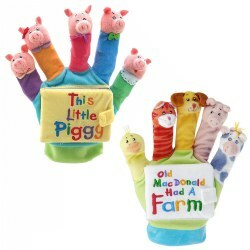 Soft and textured finger puppets and simple rhyming stories will bring giggles to babies and toddlers alike. Babies can focus on the bright colors, tactile exploration, and pointing out images. Toddlers will start looking at pictures and text and build listening and language skills. 3 years & up. What makes a person different is one of the things that makes him or her special. Vibrant, full-color photos support beginning readers and make reading informational text easy and fun. 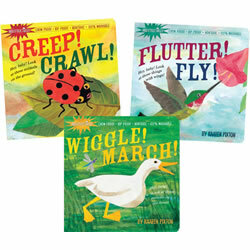 Each book includes an activity, picture glossary, and index.